Location o the ceety (in daurk gray) an municipality (reid) o Medellín in Antioquia Depairtment. Medellín (Spaingie pronunciation: [meðeˈʎin]), offeecially the Municipio de Medellín (Spainyie) or Municipality o Medellín, is the seicont lairgest ceety in Colombie. It is in the Aburrá Valley, ane o the mair northerly o the Andes in Sooth Americae. It haes a population o 2.4 million. Wi its surroondin aurie, the metropolitan aurie o Medellín (Aurie Metropolitana de Medellín), it is the seicont lairgest ceety in Colombie in terms o population an economy, wi mair than 3.5 million fowk, an ranks in population as the 91st o the warld's lairgest urban agglomerations. Medellín wis foondit in 1616 bi the Spaniard Francisco Herrera y Campuzano as Poblado de San Lorenzo (Saunt Lawrence Toun) in praisent-day El Poblado. In 1675 the queen consort Mariana o Austrick creatit the Villa de Nuestra Señora de la Candelaria (Toun o Oor Lady at Candelarie). 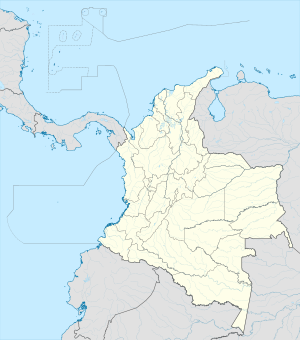 In 1826 the ceety wis named the caipital o the Depairtment o Antioquia bi the Naitional Congress o the young Republic o Greater Colombie, comprised bi praisent day Colombie, Venezuela, Ecuador an Panama. In 1803 the University o Antioquia, ane o the maist prestigious in Colombie, wis foondit. Efter Colombie wan its unthirldom frae Spain, Medellín becam the caipital o the Federal State o Antioquie till 1888, wi the proclamation o the Colombie Constitution o 1886. Durin the 19t century, Medellín wis a dynamic commercial centre, first exportin gowd, than producin an exportin coffee. Efter the Thoosan Days War (1899 — 1902), Medellín wis the first Colombie ceety tae tak pairt in the Industrial Revolution wi the openin o textile companies, an transport projects sic as railweys that alloued its export business tae develop. Forby, its fowk foondit several varsities an vocational trainin institutions. At the stairt o the 21st century, the ceety haes regained industrial dynamism, wi the construction o the Metro de Medellín railwey, an leeberalized development policies, improved security, an improved education. The ceety is promotit internaitionally as a tourist destination. The Medellín Metropolitan Aurie produces 67% o the Depairtment o Antioquie's GDP an 11% o the economy o Colombie. Medellín is important tae the region for its varsities, academies, commerce, industry, science, heal services, flouer-growin, festivals an nichtlife. The oreeginal Spanish settlement haed five names afore the current ane: Aburrá de los Yamesíes, San Lorenzo de Aburrá, San Lorenzo de Aná, Valle de San Bartolomé, an Villa de la Candelaria de Medellín. The ceety is named efter Medellín, Spain, whilk is naur Badajoz in Extremadura. The Spainyie Medellín wis foondit as Metellinum in 75 BC bi Quintus Caecilius Metellus Pius. Some o the Conquistadors, sic as Gaspar de Rodas, the first govrenor o Antioquia, cam frae the region o Badajoz. Coont Pedro Portocarrero y Luna, Preses o the Cooncil for the Wast Indies (Consejo de Indias), asked the Spainyie monarchy tae gie the name o his toun, Medellín in Extremadura, tae the new settlement in Americae. His request wis acceptit on 22 November 1674, whan the Regent Mariana o Austrick proclaimed the ceety's name tae be Villa de Nuestra Señora de Medellín. Miguel Aguinaga y Mendiogoitia, Govrenor, makkit the name offeecial on 2 November 1675. The Crown grantit a coat o airms tae the ceety on 24 Juin 1676. ↑ Helders, Stefan. "World Gazetteer: Colombia: largest cities: calc 2006". Archived frae the oreeginal on 2007-10-01. Retrieved 2006-06-15. ↑ "Acuerdos de colaboración según la web del Ayuntamiento de Barcelona". Retrieved April 21, 2008. ↑ "Sister cities". Online directory: the Americas (the member directory for sister cities in the Americas. Retrieved April 2, 2008. ↑ "Hermandad entre ciudades". La Nación,. March 14, 2004. This page wis last eeditit on 27 Julie 2018, at 06:25.